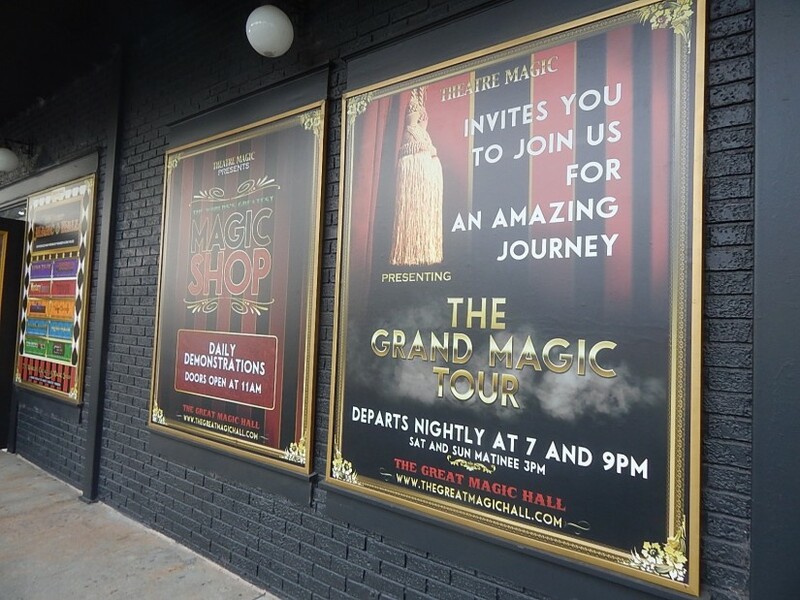 Have you heard about The Great Magic Hall, the new magic attraction that soft opened at Old Town in Kissimmee? Don’t worry, you’re not alone. 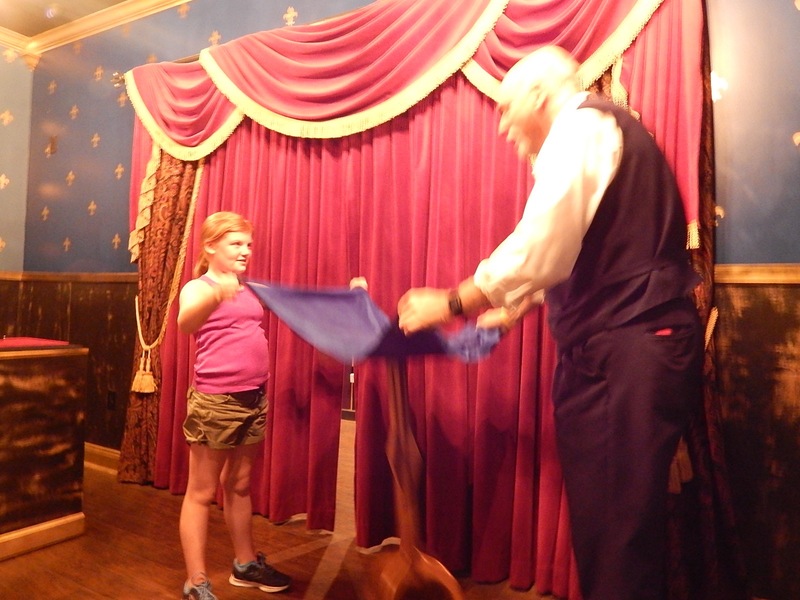 As many readers of Theme Park University know, I am a huge fan of magic and have ran articles on the famous Magic Castle in California, David Copperfield’s never-opened restaurant at Walt Disney World and even interviewed Franz Harary. So imagine my shock when I found out that a full blown magic attraction opened up right down the road from me and I hadn’t even heard of it! After being tipped off to its existence, I decided to check out the website. Fancy, for certain, and the front page boasts a total of 10 different rooms of magic that could possibly take place. Click on any of the buttons and they all proclaim the same thing: “Opening Soon!” However, that’s not entirely true. As it turns out, The Great Magic Hall is up and running! I decided to take the trip down to Old Town to see the place for myself and to see what is going on. 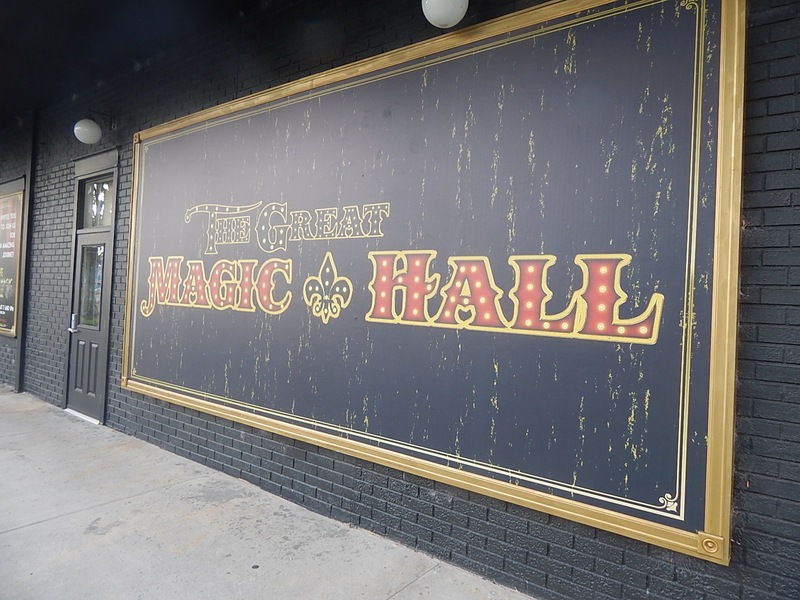 As it turns out, indeed The Great Magic Hall is on a sort of soft opening mode, but it’s not easy to tell. The doors out front often remain closed or even locked, but if you’re there at the right time they will sell you a ticket to one of multiple shows happening every night. 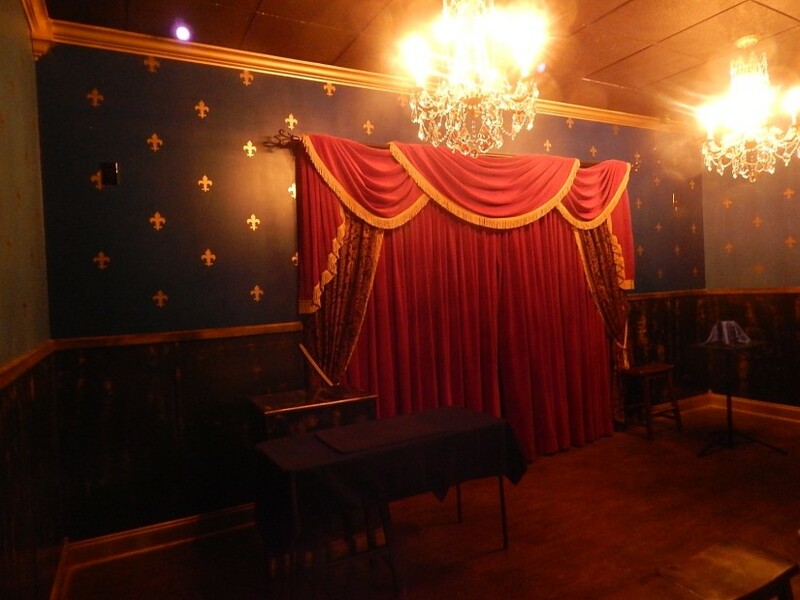 Currently ticket prices are $10 per person, which entitles you to one 30-minute performance from a revolving door of magicians that are mostly local to Orlando. According to signage, shows start at 7 p.m. and run on the hour until 10 p.m. However, shows may start earlier depending on the day and/or available talent. It is my understanding that once the location is fully opened, guests will rotate through various theaters to see several different acts, much like the Magic Castle in California. Who’s behind this? Well if you’ve ever spent any time at Universal Studios Florida, you’re probably aware of “free magic shows” being offered next to Mel’s Drive In restaurant. 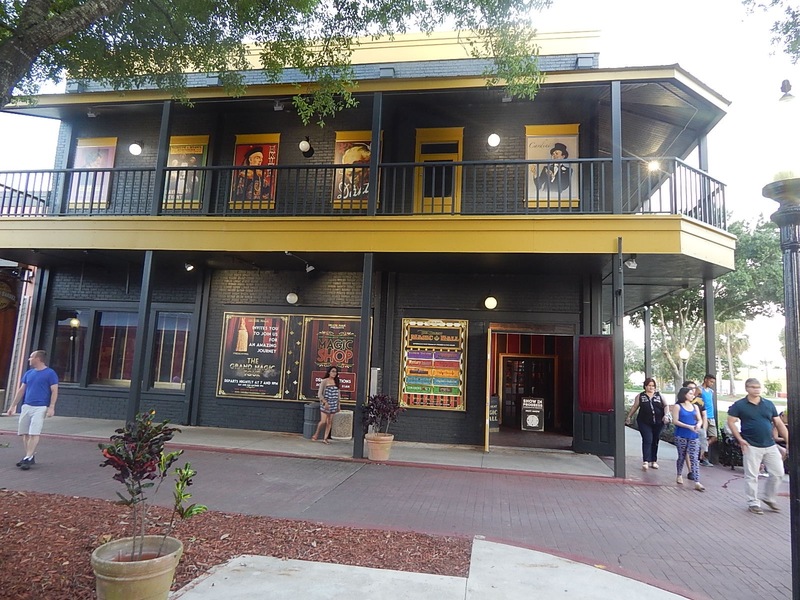 Mel’s is run by an outside contractor known as Theatre Magic who not only has an online shop, but a physical one in Saint Augustine and the one in Universal Orlando. 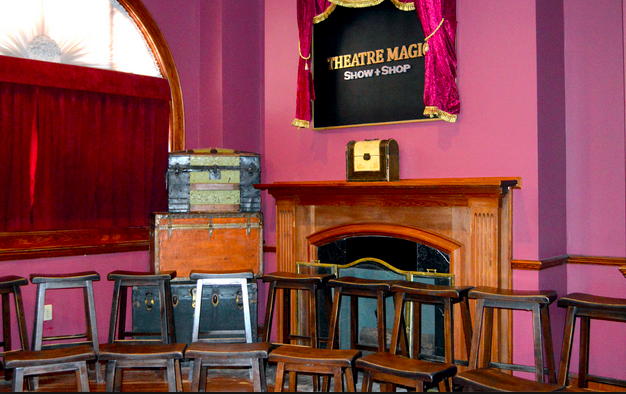 In the theme park version, your free magic show consists of tricks and illusions that you can later buy in their adjacent gift shop. 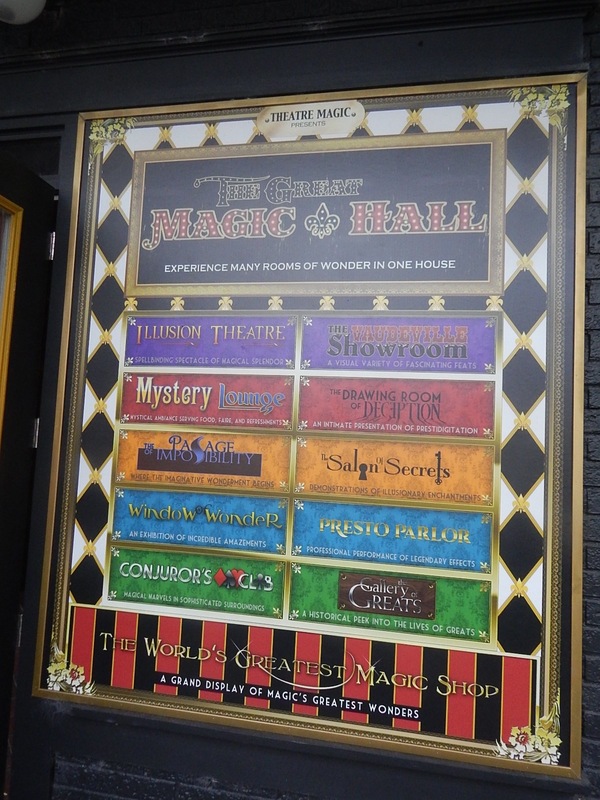 At The Great Magic Hall, those tricks are still available for sale, but the performers do routines that use props and gimmicks not necessarily sold in the store. Don’t say I didn’t warn you though, that each performance ends with a small mini-show to pimp those tricks available in the lobby. In the end, they did a pretty good job in theming the location and it looks pretty spiffy for a magic themed attraction. The performances I saw were mediocre at best and your results may vary considering they rotate magicians on a regular basis. How do you find out what magicians are playing over the next few weeks? Good luck on finding that out. Their Twitter account hasn’t been updated since November 2014 and their Facebook page is updated on occasion, but not regularly and they have yet to post a bio about any of the performers who have or are soon to appear. I wouldn’t recommend rushing out to see this just yet. They are still working on this and I am told they are expecting a grand opening sometime in fall 2015. Before you jump to the conclusion to that The Great Magic Hall just opened and I need to cut them a break, think again. This attraction has been open (even though not completely or officially) since December 2014. That’s seven months of soft operation as of the writing of this article. The Great Magic Hall has red flags all over it signaling its possible failure. From no air conditioning in the performance rooms, to the front doors being locked with no attendant out front during operating hours to a website giving absolutely no information about the offerings they currently DO have, things don’t look good. 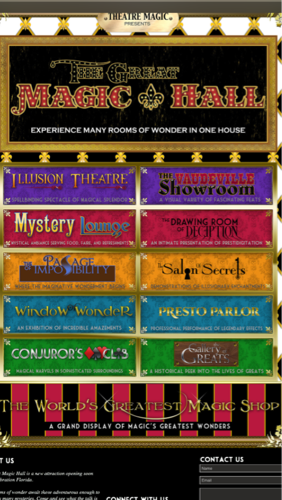 While it won’t actually tell you anything, feel free to visit TheGreatMagicHall.com if they ever decide to update it. Make sure to visit follow Theme Park University on Facebook and follow our Twitter! Making any online purchases? Click on this link before you do any Amazon purchases and it helps us pay the bills! Thanks! 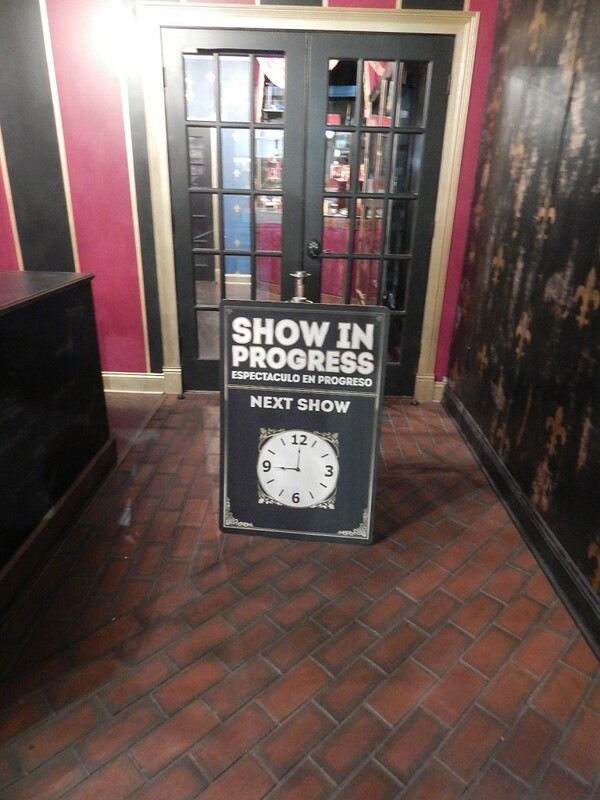 This entry was posted in Attractions, Outside The Parks and tagged Magic Attraction, Old Town, The Great Magic Hall, Theatre Magic. Bookmark the permalink. Trackbacks are closed, but you can post a comment. It is most certainly a well themed building with matching interiors. The signage is quite nice. It is odd that the soft opening has been going on for so long with no official opening yet. Perhaps they haven’t worked out the schedule and logistics, but it seems like the dragged out opening is delaying the inevitable that it won’t open. Magic is just a difficult enterprise. Many magic shows are relegated to a few headliners like in Las Vegas. That magic doesn’t have a major presence in the theme parks is telling. Perhaps a few magicians do it well. Orlando is such a tourist haven that magic is probably drowned out by the theme park wars. this is so disappointing! I think they have so much potential to make this a must see attraction. Years ago, when they first started offering street shows out of a push cart at Universal Orlando, I worked with the company for about a year. The guy who runs the entire operation is by far one of the worse humans I’ve ever had the misfortune of meeting, let alone working for. We were told that a site would open inside the universal parks, yet they didn’t actually get around to it for almost 3 years after I had left the company. Dude has a lot of big ideas, but is such a petty and rude individual that most of his ventures seem to end poorly, and if I had to lay money down, this site will follow shortly. Sad to see yet another magic attraction failing to stay open or draw a crowd.